Until recently all I knew about nearby Neutla was my students in neighboring Escobedo often brought me honey on the hive from there during my dance classes. Being raised in Hershey, PA I take my sweets seriously, but that fresh honey was the sweetest treat I’ve ever enjoyed. Also the history of Neutla was the first book I ever read in Spanish. Probably not the best choice as the history was written from the perspective of the various priests assigned there. Not a stimulating read in any language. So I was surprised just how much I enjoyed Neutla on a recent visit. No shopping or restaurants but plenty of other stuff to keep my interest for a surprisingly large town economically known for honey and mines for the ingredients used in concrete. 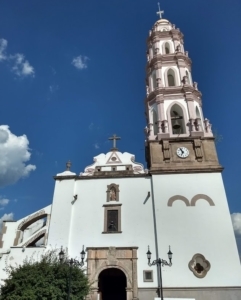 Nestled among the mountains is the town’s visual focus, the church to St. James, the Apostle. 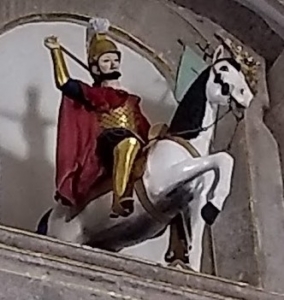 St. James is known for having joined a battle for the Spanish against the Moors often appearing in art with a hapless Moor beneath his horse’s hoofs. The legend came to Mexico with the Moor often visually replaced with an indigenous Chichimeca. Oddly, the downtrodden often appear happy to be killed by St. James. 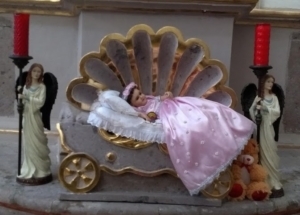 The church abounds with features of horses and since it was the eighty of the month (in honor of Mary’s birthday on September 8th) the church featured Mary in a stylish carriage complete with rattle and stuffed toy. Our Lady likes to travel in style! 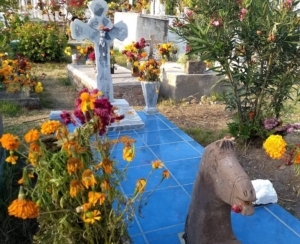 The horse motif continues into the town’s cemetery, a lovely spot featuring many horse statues and the remains from the recent Days of the Dead, giving the place an intriguing Gothic flair. 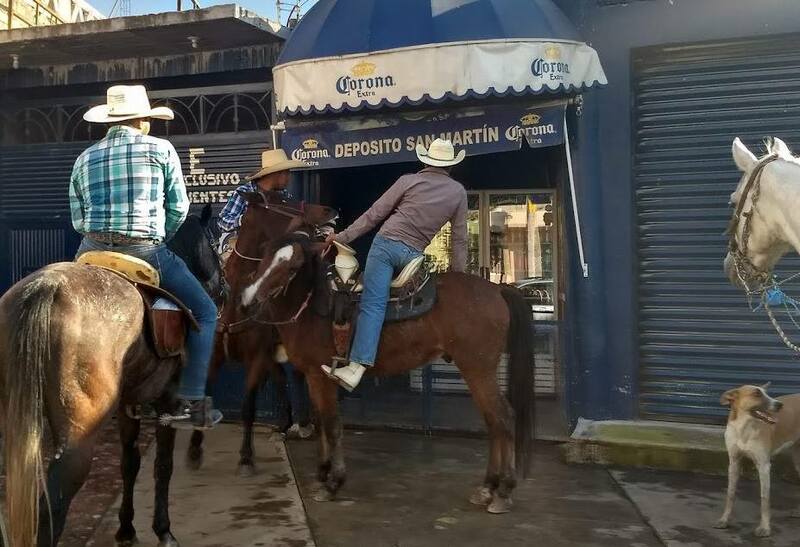 The importance of horses continues with the main street in town being named for St. Martin, the patron saint of cowboys. 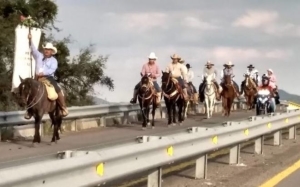 Lucky for me I visited on the day cowboys arrived from all over the state making their way to town of St. Martin, to have their horses blessed on his feast day. After a quick beer stop, the lads and lasses settled in a city park lined with hay for the horses and pazole for the people. Go a bit farther from town for an Alpine-like lake lined with mountains and wildflowers. Truly gorgeous and marvelous to have a mountain lake so close to San Miguel. 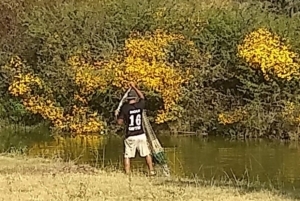 Granted, we’ve our own lake but it is surrounded by mud and thorns lining the shores. Consequently our lake is only pretty from a distance. I’m constantly amazed how many folks eat fish from the lake. I’d sooner eat my own foot. Nearby Jalpa has a lovely lake setting alongside both the town and picturesque rectory ruins. However, the lake, both times I’ve been there, has an odd aroma of pooh permeating from it. Not Nuetla! The lake here is border by mountains, two small farms and fields of those much-loved horses. For a mere 10 pesos you can park and enjoy a picnic with grills, bathrooms and shaded tables for eating. It is simply breath taking! Plus I’d eat the fish caught here! So if you like horses, honey, art or simply a day in nature with great views, Neutla is calling your name! Trot on over!